Already Answered – Every question is already answered . . . all you have to do is find the question. Every question is already answered . . . all you have to do is find the question. To read more about the Distant Starlight “Problem” see here and here. 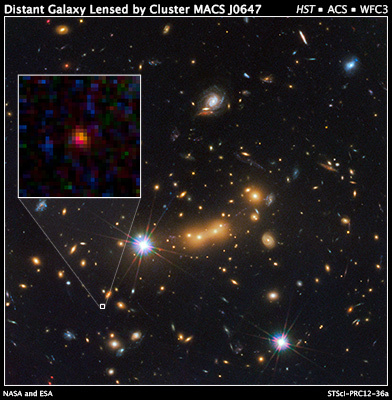 On November 15th, Hubble released an article on their website about the most distant galaxy they have ever found. At some 78,184,047,528,993,000,000,000 miles away, this galaxy has been said to give astronomer’s an amazing new sight into galaxy’s evolutionary history. Some might wonder, when reading this quote, “why do the universe is billions of years old and then say this galaxy is only 420 million years old?” The answer is found in the complex theory of the speed of light. According to common knowledge, lights travels at 186,282 miles per second, 11,176,920 miles in a minute, 67,0615,200 miles per hour, 16,094,764,800 miles per day, 112,663,353,600 miles per week, and some 5,878,499,814,210 miles per year. As you can see, light travels very fast. Anyway, when evolutionists “find” a new galaxy they look at it and calculate how many light-years it is away from the Earth. Then, once they have calculated that, they take the supposed age of the universe, 13.7 billions years, and work out the current age of the galaxy they are seeing. However, since the galaxy they are looking at is so far away the evolutionists assume that it is just in its “baby” stages and this will give us a great look into the evolution of galaxies. But, something the evolutionists forgot is that this galaxy has always been visible but we just haven’t developed, until now, the right tool to see it. Its light is always there, the only way the evolutionists can guess at the age of the galaxy is because of the speed of light. Well, there we have it, we somehow got back to the gigantic debate about distant starlight! To answer this question I recommend you read this article and this one. If you still have questions go here and see Jason Lisle, who wrote the first article and has done years of research into this, at his website. He gets all kinds of questions about starlight and he is literally a genius on the subject. I find it interesting how the evolutionists, in general, make a job out of assuming things and then make a hobby out of accusing us of assuming things!